I recently had the urge to play World of Warcraft again. This was mostly due to my desire to be more immersed in the lore. I really do like that aspect of Warcraft. Before paying for a month I leveled a few characters to level 20, which is free. I wanted to see if it would keep my interest before I spent actual money on renewing a subscription. I leveled up a Blood Elf Paladin, found I enjoyed it, but wanted to see how long that interest would stick around so I made another character, a Pandaren Shaman. I found I enjoyed that as well but I still wasn’t sure so I leveled up one more character. This time a gnome hunter. Yep, still enjoyed it so I dropped the money. I decided to focus this month on my new hunter, I wanted to unlock some new lore and I thought the hunter class questline would be fun. This character was also on a new server, the Wyrmrest Accord, a role play server. 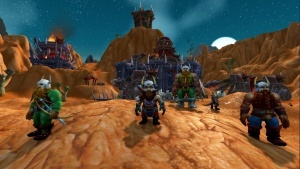 I started my Warcarft career back in vanilla on a pvp server but eventually transferred to a normal server. I chose this new server type solely because there were people I knew who were active on the server, although it’s turned out that we’ve done no group content, it’s basically just been chatting. Aside from the obvious tendency to role-play the biggest difference I saw on this server from my main server was the economy. There seems to be a bigger emphasis on appearances and it showed in how much some low level green items were worth. Normally green items are trash, you just sell them to a vendor but on this sever there was a good amount of people buying items, at inflated prices, what I can only assume was to unlock the transmog appearance. One low level blue item sold for nearly 3,000 gold. Before level 60 I made approximately 10,000 gold. However, this wasn’t just due to items. I have also found that a good way to make money is by gathering resources. I skipped doing any of the production based professions and stuck just to mining and herb gathering. Those items always sell for a decent amount, especially when leveling between level 100 and 110. Of course I didn’t start playing again just to gather and horde gold, I wanted to unlock some new lore but to do that first I needed to hit level 100. Leveling is a lot easier than it used to be back in the day thanks to the introduction of heirlooms. I had purchased items for a hunter a long time ago so I was good to go, at least till level 60. Luckily, as I mentioned I had a pretty good income coming in and I was able to spend that on upgrading my heirlooms without any issues. Levels 20-60 were relatively easy, even enjoyable. Early on I did a lot of questing, enjoying the story line up to level 30 but then I started doing random dungeons, which quickly leveled me beyond the content I was currently on, which I was fine with. Level 60-80 was a lot slower. I was still doing random dungeons, but the wait times were longer. I continued to quest to supplement my experience. I considered slowing down and playing around more in Burning Crusade content but it got too repetitive and I really wanted to get to level 90 to work on building up my Garrison in Warlords of Draenor. I decided to push through as fast as I could. I enjoyed my brief time in the Wrath of the Litch King but it seemed to go rather quickly, as did my five levels in Cataclysm. By far the most unenjoyable time was 85-90. I have nothing against Mists of Pandaria, I enjoy pets, but it was very tedious. That level block seemed to take forever, dungeon wait times were horrible and the questing was too linear. 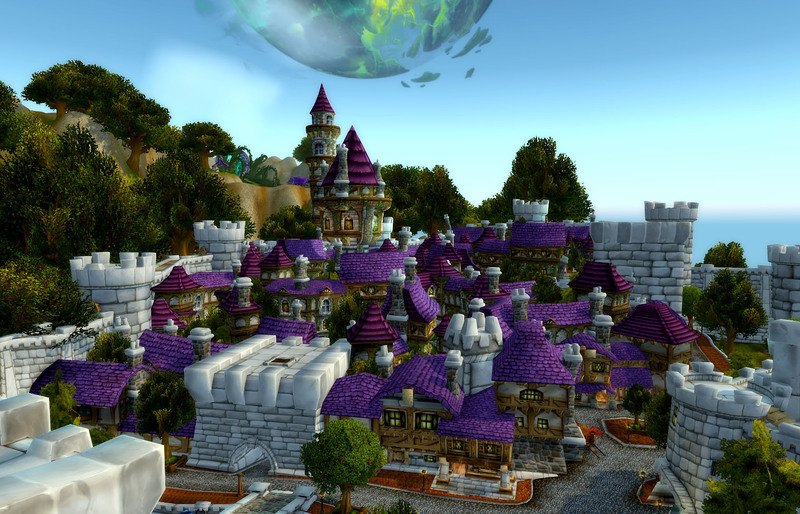 At least with other expansions you can chose to go to different areas, in MoP the area is limited. Levels 90-98 were fun. I did dungeons, but I did mostly questing. I did most of the quests in the Shadowmoon Valley, a few of the quests in Talador and quickly moved into Spires of Arak. 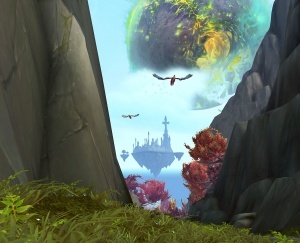 Thanks to the heirlooms the experience ark was much different than it was when Warlords of Draenor was the newest expansion; I ended up skipping a lot of the content; I completely skipped Gorgrond. The last quest I finished in WoD was the one to unlock the Salvage Yard for the Garrison. I was well on the way to setting up my Garrison to produce some money but once I left the expansion I was never able to return home thanks to a bug. I was unable to use my Garrison Hearth Stone after level 100, when I did it would kick me out of the game. According to the internet the only fix was to disable my addons but even that didn’t help, so I gave up on using it as a money mill. As soon as I received the quest to leave WoD at level 98 I left. My hunter is specialized for Beast Mastery which lead me to the artifact, Titanstrike. I was very happy with the experience. It went into the Titan Lore which I really enjoy. The gun itself is very sleek, not large, bulky and gawdy, which is a way they could have gone. It looks like a proper space gun, worthy of a titan. Of course it’s not titan sized, thankfully they made it gnome sized so I could use it. Almost like it was made for me. It’s special ability is a second active pet, Hati who is one of the Watcher Thorim’s two pets. He gives him to you as a gift for helping him along the questline. By the time I hit level 110 I had spent a little over three days in game. Sadly I didn’t get to level 110 till about day 20 so my time at max level has been limited. I’ve been working on gearing up so I can more easily quest on the Legion planet, Argus; it’s been a bit tedious. I’m currently sitting at 845 item level. My main, who is a Shadow Priest is sitting at 860 so I’m not that far off from where I left off when I canceled my subscription pre 7.2. My month is about over and I’m not sure I’ll be able to subscribe for another month. The gold cost for game tokens have skyrocketed since the last time I played. Back when I left it was about 70k gold and now it’s sitting around 167k gold. It’s a lot than I could gather unless I spent good amount of my time farming and playing the market which wasn’t something I felt like doing. Over the next couple days I’ll decide if I can continue my new journey in Warcraft. It would be nice to at least do a few raids this expansion and I started doing the old raids, gathering pets, appearances and achievements with my friend Dale. If I were to continue I’m sure I’d be doing more old content on a weekly basis. This is part 1 of a Chrono Trigger series that I'm streaming on Twitch. Each Tuesday at 8pm I'm playing the game for at least an hour till I finish the game. After that I"ll move on to a new classic SNES RPG.